Discussion in 'GPS Tracks - Central, Texas & Gulf States' started by Cannonshot, Jan 1, 2007. -a section of the Tri County Trail (an old railroad grade now used for recreation). This trail has rules and is patrolled so before you get on it, check out www.tricountytrails.com for information. This route puts you on the trail near Browtown and takes you off at Darlington. 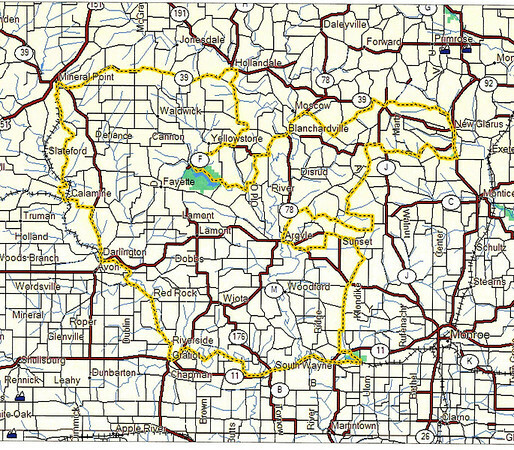 The area is SW of Madison, WI and covers parts of western Green County, eastern Lafayette County, and southern Iowa County. Overview Map (the shape of the roads gives you a good idea of the topography of the area that makes this an entertaining ride). Arggh - I just passed on buying a place outside of New Glarus - may'be in a couple of years. Thanks for tip - all the more reason to head up there! Added a Route to the GPX File. Cut track into smaller segments. We will be in the area headed to the northwoods soon, taking the ferry across to Manitowoc and arriving at 1100 am, Can you recomend any place to camp along the way? Looking for something for the first night in particular. We should be able to make 200 miles before camping after we depart the ferry. Mr. Salty Pretty quiet. Mostly. I've done the cheese country trails a couple of times this year, all the way thru from Bellmont, to Mineral Point, to Monroe, and back up. My dad was raised in Brown-town; cute little town. - Now I have to try out your GPS tracks! Thanks! CHEESE COUNTRY TRAIL STICKERS are sold for $8 per annual calendar year. Effective July 1, annual stickers will be $15. In state ATVs are NOT required to have trail stickers, but all users are encouraged to support the trail by purchasing an annual Tri-County Trail sticker. Out of state ATVs should refer to ATV Registration for additional information and requirements. Just a note that it is very easy to ride on the road next to this trail if you want to keep it legal without a sticker. The route just jumps on a section of it between a couple of the towns. I had previously ridden (and paid for) the trail a couple of years ago and decided that it wasn't worth paying for again. Their were several cops along the way so I was glad I had paid before, so ride without a sticker at your own risk. Rode parts of this loop today (thanks Cannon!). I see what you mean klr about riding next to the trail. I just stuck to the highways too as the website showed the trail was closed until full thaw. I'm going to ride this loop tomorrow, thanks Cannon! 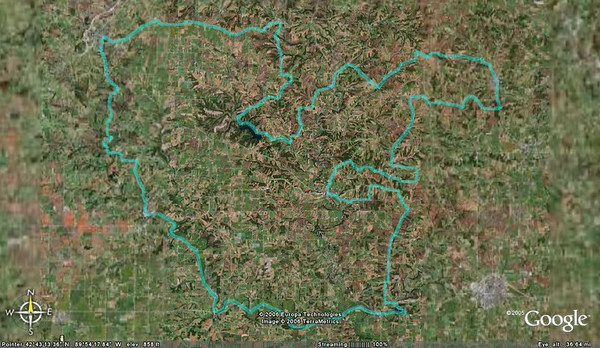 I can post GPX to ADV again so this is the replaced lost file.